After his appearance on the Saturday Night Live show, Kanye West decided to give a speech in support of the U.S President, Donald Trump which earned him boos from the audience. The rapper was scheduled to perform three songs to help launch the new season of the comedy show on Saturday, 29th of September 2018 after which he decided to give a speech in favor of the former businessman despite the fact that he has been criticized several times earlier this year for posing as a pro-Donald Trump supporter. 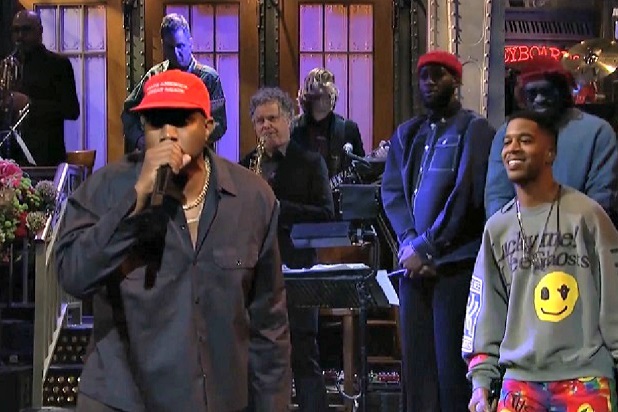 While giving the speech, Kanye was wearing a Make America Great Again baseball cap which has become a popular symbol amongst Donald Trump supporters. Chris Rock, a man as shocked as most of the people present there by rapper’s outburst, captured the video and later posted it online. In his speech, Kanye confesses that white people often come up to him and ask him his reason for supporting a racist U.S President. In reply to that, he always says that he would have left America and settled somewhere else if he started supporting politicians based on their color preference. Referencing the popular horror film Get Out by Jordan Peele in which the lead character is hypnotized and brainwashed, Kanye declared that he does not care what people think about his support and it does not matter to him that people do not share his opinion because they are all entitled to their own. The rapper also shunned people who make memes to make fun of his friendship with Donald Trump. While recording the video, Chris Rock can be heard laughing while members of the audience scream and boo at Kanye. An eye-witness also stated that as soon as the artist started to vent in favor of Trump, everyone went silent. After concluding his rant, Kanye thanked the cast for letting him speak his heart out even though some of them had been against it. Later on Twitter, the rapper hinted that he might be back on the show but, this time he would come back to host, most likely by the end of the year.